I don’t buy a lot of RTW. Most of my wardrobe is handmade, as is a large percentage of my daughters’. However, I’ve drawn a few lines in the sand as to what I see value in making and what I don’t. I generally won’t make knit tops and leggings for my girls, unless of course I already have the fabric in my stash (most likely a remnant from something else I’ve made – nothing goes to waste here). These items are just so easy to buy for next to nothing (ethics aside) and they get trashed by my kids anyway. I’d much rather spend my time sewing more interesting garments. For me, the same applies to jeans and faux fur. I view jeans as a technical make, but not due to the sewing (I agree with all the pattern makers out there – don’t be scared of sewing jeans if you are so inclined). It’s the hardware and denim fabric that I don’t have the time or inclination to hunt down myself. And the same goes for faux fur. The location I reside prohibits me from visiting a well-stocked bricks and mortar store where I can pat and caress all the fabrics. It gets wearisome and costly relying on swatches for everything, and this definitely impacts my choice of textiles. But back to the outfit of the day. I present you with one of the very few complete RTW outfits in my closet. The jeans are DL1961 and I love them for a few reasons. The colour is great and the fit is superb. I love the leg length (I’m 5″10 so the legs are long). The denim is pretty amazing too. It’s lusciously soft and stretchy. The composition is 64% tencil/modal, 34% polyester, and 2% lycra. Nope, not cotton, but they do look like it! Now perhaps if I could get my hands on some of this fabric for a decent price, I’d reconsider my stance on sewing jeans. The vintage coat is mouton fur, which is sheepskin that has been processed to resemble smooth, glossy beaver fur. This is an old coat (circa 1950?) with a gorgeous cropped style. I love the shape of it and the fit is perfection. The front fastens with a hook and eye. I need to re-stitch the eye in place, but otherwise the coat is in excellent condition. I’m not going to delve too deeply into the ethics of purchasing or wearing fur. There are justifiably strong feelings on the matter. I love the look and feel of real fur but it doesn’t sit easy with me. Lamb/sheep/goat/cow products are a different matter. I don’t eat a lot of meat (for health and sustainability reasons) but I’m still partial to the occasional steak or lamb chop and I definitely won’t turn my nose up at slow roast goat or a platter of cheese. Therefore, it would be quite hypocritical of me to shun the hides of these animals. With that in mind, I can assure you that I will be giving this old coat the love and care that it deserves. This entry was posted in Uncategorized and tagged coat, fashion, jeans, outfit, RTW, vintage on November 16, 2015 by Debbie Iles. Vintage is my jam. I have a lot of it, and pride myself on taking good care of it and giving it a great 2nd (or 3rd, or 4th!) life in style. My collection has grown to include some fur pieces, much to my surprise. 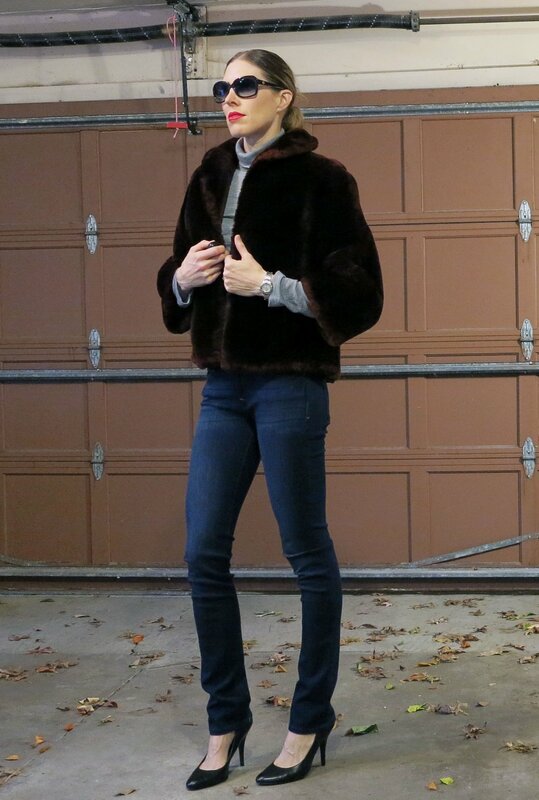 In most cases, I have a very strong personal ethical opposition to wearing fur produced in the present era (which I will not bore you with), but I do not have the same difficulty with vintage furs. The garment was produced long before I was even born (in the case of all of my fur pieces, long enough for the animal(s) in question to have lived multiple lifetimes–I don’t know about you, but I’ve never heard of a rabbit living to be 90!! ), and I do not think it does the sacrifice of the animal(s) who died to produce the hide(s) any justice at all to allow the garment to go to a landfill. And having worked in a vintage shop, my experience has been that fur is very, very difficult to sell as soon as most people find out it is genuine, no matter how old it is; as such, I do not put a lot of stock in the canned “But you’re glamorizing wearing fur! !” counterpoint responses that I have seen or heard in the past. (YMMV, of course.) As I see it, we all get to make that decision for ourselves and work out the ethics in our own minds. You nailed my feelings on sewing jeans. It’s not that that I think I can’t sew jeans, it’s that it takes so many out-of-the-norm details to get them right–the rivets, the denim weight, etc. Since I can find RTW jeans that fit me and that I love the feel of, putting all of that effort into a garment that’s pretty, well… unexceptional just seems unnecessary.